Nashville, Tennessee, is known for its strong country music heritage. Explore the Grand Ole Opry, where some of country music’s greatest stars perform. Immerse yourself in music history and explore displays on bluegrass, cowboy music, country swing, rockabilly, Cajun, honky-tonk, and contemporary country music. For non-music attractions, check out the Cheekwood Botanical Garden and Museum of Art, the Tennessee Sports Hall of Fame, and the Adventure Science Center . A Nashville vacation offers music, culture and more. No trip to Nashville is complete without a visit to the Grand Ole Opry, a famous venue home to the longest-running live radio show in America. Board one of the country's largest paddle-wheel boats for a spectacular lunch or dinner cruise down Nashville's Cumberland River! The Country Music Hall of Fame and Museum isn't just a museum, it's an experience, an exciting and entertaining destination. It's not just Hollywood where you can see the stars' homes - Nashvillle also has its fair share! Discover some of Nashville's cultural gems on this tour to the Grand Ole Opry House and Gaylord Opryland Resort. Get entry into 4 popular attractions in Nashville including The Country Music Hall of Fame. Resort info: Recognized for its personalized service, polished accommodations and first-class entertainment, this hotel appeals to golf and music lovers. Resort info: The Hyatt Place Opryland has everything to make your stay in Nashville one to remember. Resort info: In the Heart of Music City, USA guests are promised the perfect pairing of Southern hospitality and convenience. Resort info: Located only 12 miles from the Nashville International Airport, directly between the sites and sound of Nashville and the shops at Cool Springs. 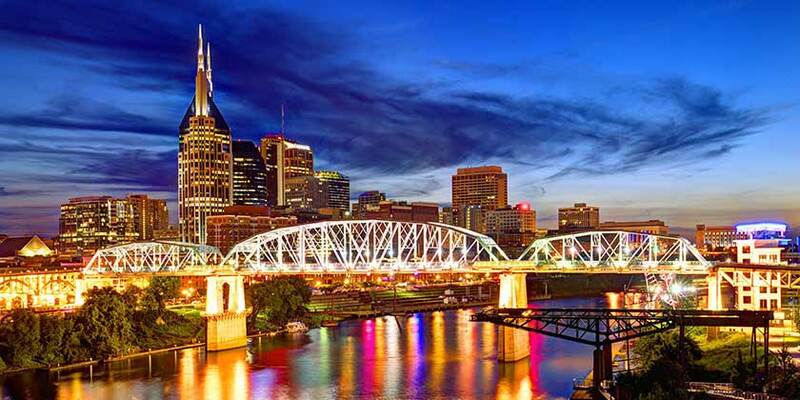 Resort info: Connect with the heart of downtown Nashville at the Country Music Hall of Fame or experience the awe of The Grande Ole Opry. Resort info: A central location adjacent to the Gaylord Opryland Resort and Convention Center, near major attractions and businesses and 11 miles from downtown. Resort info: The Ramada Nashville Downtown is located on the East Side of the Cumberland River, next door to LP Field Home to the TN Titans.